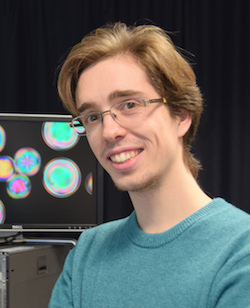 Guillaume Durey, PhD student at Gulliver laboratory, EC2M team, was awarded the Fondation Langlois prize for the dissemination of research, intended to support young researchers in communicating their research results. This award will be used to present his work at the International Conference of Liquid Crystals in Kyoto in July, and to give a seminar at Kyoto University, where Ms. Yoko Ishii, who was invited to the Gulliver laboratory last spring, is an associate professor. At the same time, he received the first prize from the Gallery of Fluid Motion awarded to a video from the YouTube channel: The Lutetium Project , funded by ESPCI Paris, PSL Research University, ESPGG, ESPCI Alumni and Fonds ESPCI Paris. This video, made with the team of arts students in science that drives the channel, is based on research conducted at the PMMH laboratory published in Physical Review Letters this year. The Gallery of Fluid Motion is a competition organized by the American Physical Society to reward the best fluid mechanics videos of the year. The video is available in English on the Gallery of Fluid Motion website, and in French on the Lutetium Project YouTube channel.